Sitting at the juncture of the South, the Midwest, and the mountainous spine of the Eastern seaboard, the state of Arkansas is an outdoor-lover’s playground. With rivers and mountains serving as a prominent part of the landscape, it would take a lifetime to fully explore every winding waterway. You may not have that sort of time, so here’s how to maximize your exploration schedule. The cycling infrastructure within The Natural State is unsurprisingly targeted towards mountain bikers, but with that said, even casual cyclists can get a lot of mileage, as it were, out of pedaling around. In the charming capital of Little Rock, the Big Dam Bridge forms a rusty rainbow over the Arkansas River and acts as a junction of several miles of multi-use trails that connect Little Rock and North Little Rock. On either side of the river, the bridge links up with the Arkansas River Trail System, which forms an 88-mile loop that joins Little Rock, North Little Rock, Maumelle, and Conway. If you’re with kids, the Arkansas River Trail runs past the Central Arkansas Nature Center, which makes for a good youth-friendly introduction to the region’s ecology. Fourche Creek is one of the most important urban wetlands in the country. The pretty wetland system has been subject to pollution in the past, but the area’s old scenic beauty is being restored thanks to efforts from organizations like the Audubon Institute. This deep green swampland begs to be explored, and if you’re hearing that call, pay a visit to Rock Town River Outfitters, which should be able to hook up both gear and tips on paddling in the capital area. This town can lay claim to a nice bit of bar trivia: the local National Park is the oldest protected land within the national park system, although not the oldest national park. That’s because the hot springs of this town were first set aside for federal protection in 1832, 40 years before the first national park (Yellowstone) was established. 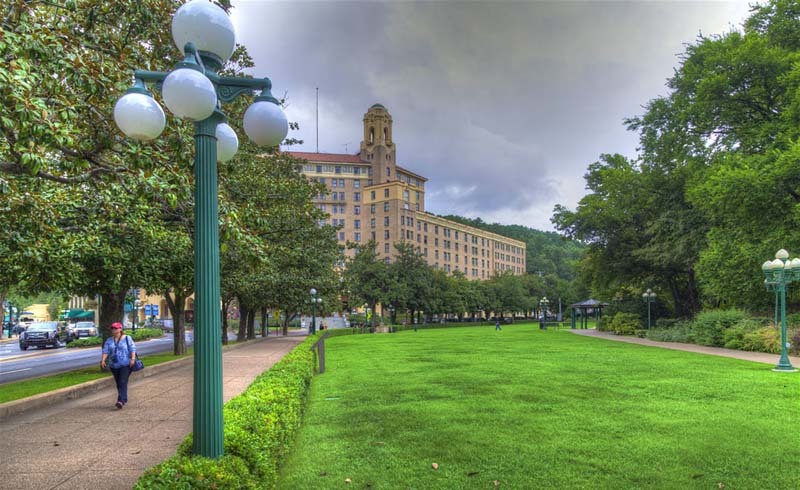 For all that, the town of Hot Springs is mainly notable for its handsome architecture and quaint, artsy downtown area. But there are plenty of outdoors opportunities. There are tons of areas for hiking and cycling within the Ouachita (Wash-uh-tah) National Forest, and paddlers and fishers all flock to the shores of Lake Ouachita. 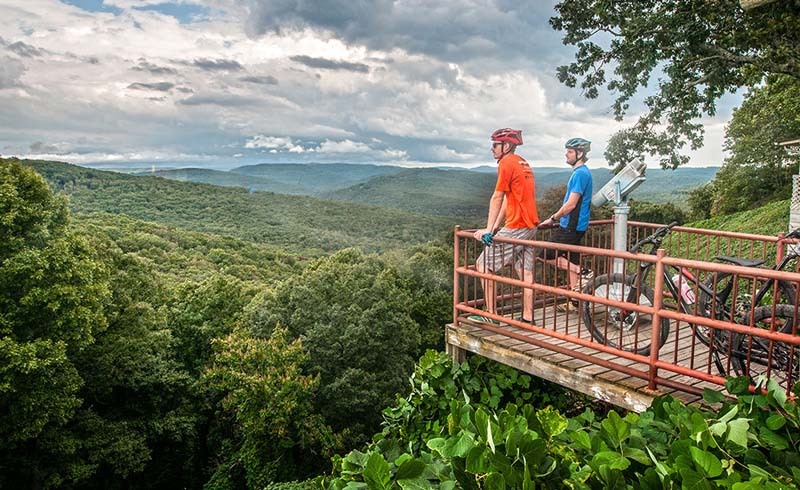 The dominating natural feature of Northwest Arkansas ­– and some might argue, the entire state – is the Ozark Mountains. This extensive highland region – the largest between the Rockies and the Appalachians – is a wrinkled, forested dream of rock gulleys, flinty valleys, and ice cold springs. 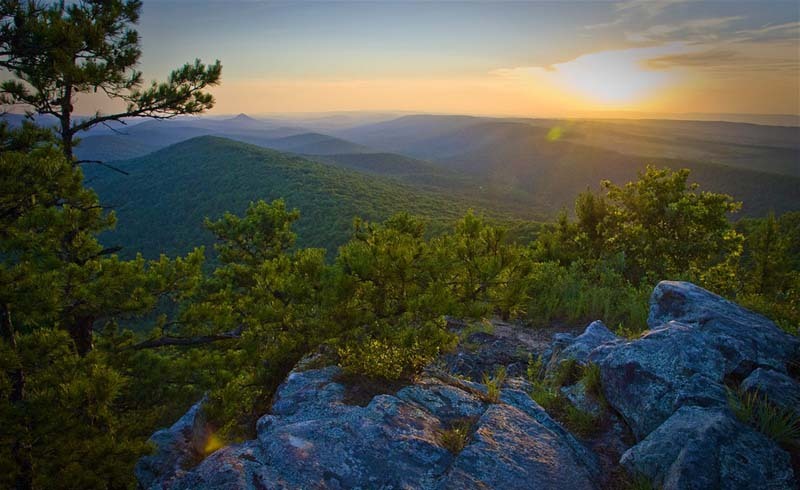 There are countless means of exploring the Arkansas side of the mountains (the region covers four states), but a good entry point is the Ozark Highlands Trail, which extends for some 270 miles and is simply one of the most impressive walking tracks in the Southern United States. 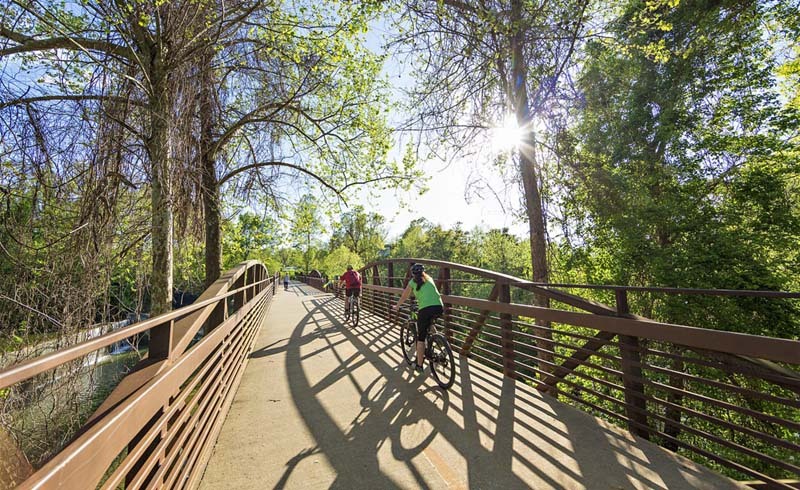 Hikers and cyclists alike will enjoy the Razorback Regional Greenway, which runs from Fayetteville some 36 miles north to Bella Vista, passing through the surprisingly cosmopolitan town of Bentonville, which is in and of itself a mountain biking hub. Pedestrian and bike-friendly trails weave past major attractions like the ultra-modern Crystal Bridges Museum of American Art, and in both Bentonville and Fayetteville, you’ll find downtown areas where you can refuel on caffeine or refresh with a good lunch. In Fayetteville you’ll find Kessler Mountain, although we use the term ‘in’ Fayetteville loosely; being on the mountain feels like getting (pleasantly) lost in the woods. The mountain is the home of a regional park that is a major gathering space for Fayetteville’s very active outdoors community. Do you want to get some tear down the mountain fresh air in your face? In artsy Eureka Springs, get out to Lake Leatherwood City Park, where a shuttle service gets you access to seven downhill-only trails that are each about a mile in length. Fair warning: these are steep drops! One of the trails is a more scenic ride that is acceptable for careful beginners, but the other trails are very much aimed at experienced riders. The city park also plays host to other trails that are decidedly more forgiving for beginner cyclists and walkers. 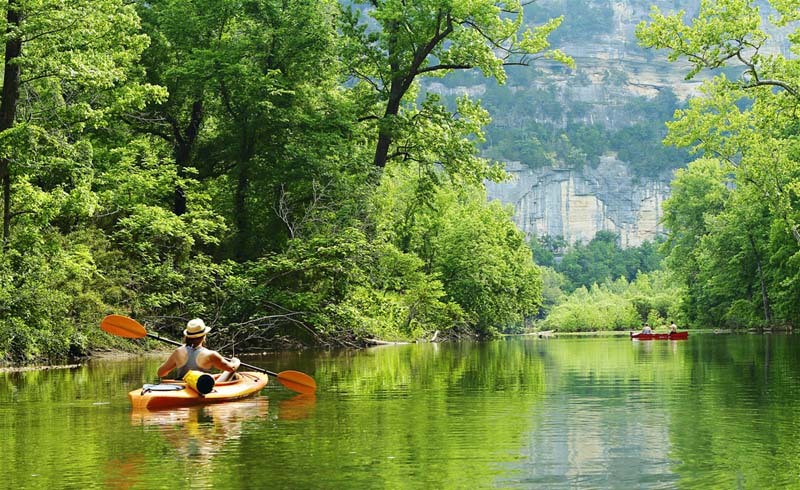 There are some 9,700 miles of river in Arkansas, and the most iconic waterway – besides the Mississippi – is the Buffalo National River, which is managed by the National Park Service (you’ll find a visitor center in Tyler Bend). Many visitors prefer to take a few days to camp and explore the length (or at least part of) the Buffalo River. Outfitters can help manage the logistics of such a trip. Note that water levels can rise or fall rapidly based on the weather and rain, and that the cold waters of the Buffalo can run fast and dangerous. Even in the calmest looking waters, you need to wear a PFD (personal flotation device) – it is very easy to capsize on the Buffalo. 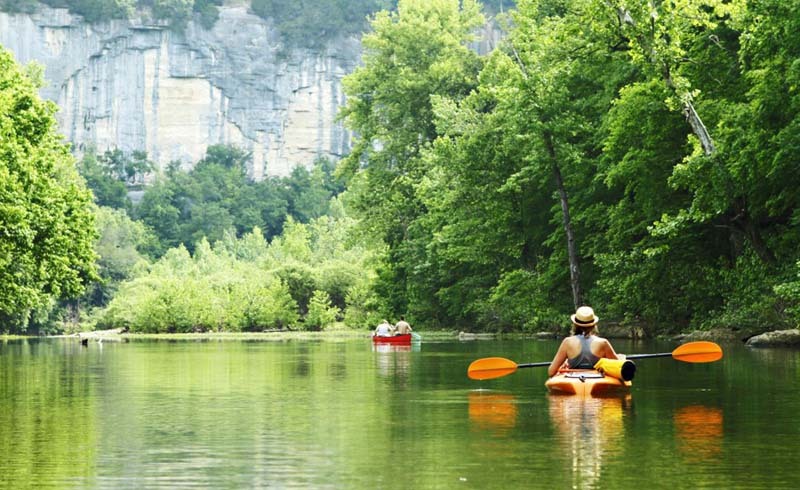 Paddling isn’t the only activity by the Buffalo National River. If you’ve got some biking skills and are outdoors-savvy, don’t miss the Upper Buffalo Mountain Bike Trail. The 40-mile trail is remote, and you’ll likely have to make water crossings, but it’s one of the most beautiful rides in the state.